Low back pain (LBP) is one of the most common musculoskeletal problems for seeking medical advice, and its prevalence has been reported globally and found to be ranging from 15% to 45% among the general population.,, Moreover, it has been reported that more than half of the general population will suffer from LBP at some point in their lives. It was found that LBP has a great impact in job performance regarding disability and absence as it was reported that LBP may lead to having sick leaves by more than half of the nurses., Many studies that investigated the risk factors associated with LBP among hospital staff, high body mass index (BMI), smoking, more working hours, and low job satisfaction, stated that these are risk factors for having LBP.,, A study in Saudi Arabia reported that nurses, who work in a surgical department, were at more risk to develop LBP than their counterparts in other medical departments. However, Al Dajah and Al Daghdi reported that operation theater staff were more affected than other healthcare workers. In the same contexts, Mohseni-Bandpei conducted a study among surgeons and reported a high point prevalence rate, 39.9%. There is a lack of studies that estimated the prevalence among the general population in Saudi Arabia, although one study conducted by Al-Arfaj in Al-Qaseem city reported a prevalence of 18.8%. Among healthcare workers also the prevalence was consistent with worldwide ranges.,, To the best of my knowledge, there are no studies have been done among surgeons in the Saudi Arabian context especially in Taif city. Therefore, the purpose of this study was to assess the prevalence among surgeons working in Taif city, Saudi Arabia. In addition, we investigated different occupational and individual characteristics or potential risk factors associated with the prevalence of LBP. This study conducted a cross-sectional method, carried out among surgeons in Taif city, Saudi Arabia, from January 1, until the end of March. Targeted participants were surgeons from various specialties as general surgery, Obs and Gyn, orthopedic, urology, otorhinolaryngology head-and-neck surgery (ORL-H and NS), and others. Three hospitals were involved in this sample, one general hospital, King Faisal Hospital (KFH); and two tertiary hospitals, Al-Hada Military Hospital and King Abdulaziz Specialist Hospital (KAASH) as these are the major and the biggest hospitals in Taif city. Data were collected from 141 participants, and three were excluded according to the excluding criteria mentioned below. Hence, 138 participants were further investigated, 62 general surgery, 31 Obs and Gyn, 10 orthopedic, 10 urology, 10 ORL-H and NS, and 15 other surgical specialties. A self-administered questionnaire of 41 items, developed after reviewing the previous studies related to our subject, and used to obtain the information, conducted and supervised by well-trained data collectors. The questionnaire was formed of three sections. The first section is demographic data, and the second section is about the occupational and personal characteristics that may carry potential risk factors of LBP such as specialty, job satisfaction, stress at work, and smoking. Furthermore, the excluding criteria were formed in shape of 6 Yes or No questions and placed in this section. The third section formed to assess the prevalence of LBP and pain characteristics as severity, frequency, management received, and preventive strategies used. LBP was defined and explained to the participants as “pain, muscle tension, or stiffness localized below the costal margin and above the inferior gluteal folds, with or without leg pain." The study included all male and female doctors in all the surgical specialties who are working in the targeted hospitals in Taif city, whether consultants, specialist, or residents. Participants, who had a previous history of back or spinal surgery, any fracture or disorder in the pelvic region, spinal deformities, osteoporosis, back or spinal tumor, or any other malignancies, have been excluded from the study. Data were entered and coded by Microsoft Excel 2016, and then analyzed using IBM Statistical Package for the Social Sciences (SPSS) Software version 21. The frequency was used for categorical variables and mean ± standard deviation for continues variables. Chi-squared test was used for statistical significance and considered statistically significant when P < 0.05. A total sample of 138 participants was obtained after applying the including and excluding criteria, and three participants were excluded from the study. The sample was collected from the three major hospitals in Taif city which are KFH with 59 participants (42.8%), KAASH with 41 participants (29.7%), and Al-Hada Military Hospital with 38 participants (27.5%). 107 (77.5%) of the participants were male. Resident surgeons were 62 (44.9%), specialists were 43 (31.2%), and consultants were only 33 (23.9%). 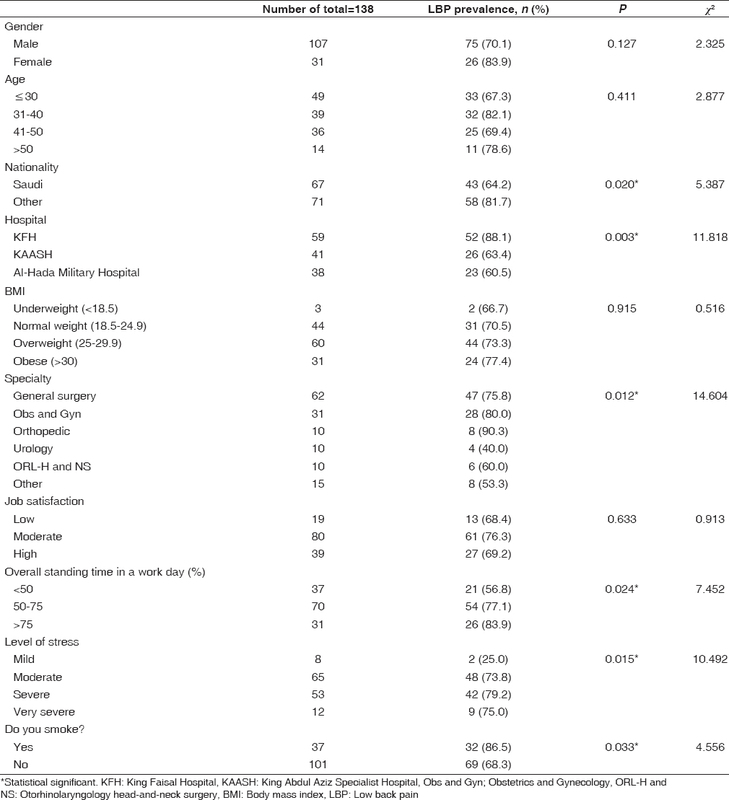 Other demographic data and occupational characteristics of the participating surgeons are shown in [Table 1]. The prevalence data of LBP was found as a point prevalence of 28 (20.3%), those who had LBP in the last month 67 (48.6%), who had LBP in the last year 91 (65.9%), and the lifetime prevalence was found 101 (73.2%). 77 (76.2%) of the affected surgeons had their first attack of LBP after becoming surgeons. Most of the participants, 59 surgeons (58.4%) do not usually seek special treatment, and their pain is relieved only by rest. Other characteristics of LBP are summarized in [Table 2]. It includes the duration of the pain, when it is usually the most, frequency, severity, requesting sick leave for the pain or not and how many times and management received. 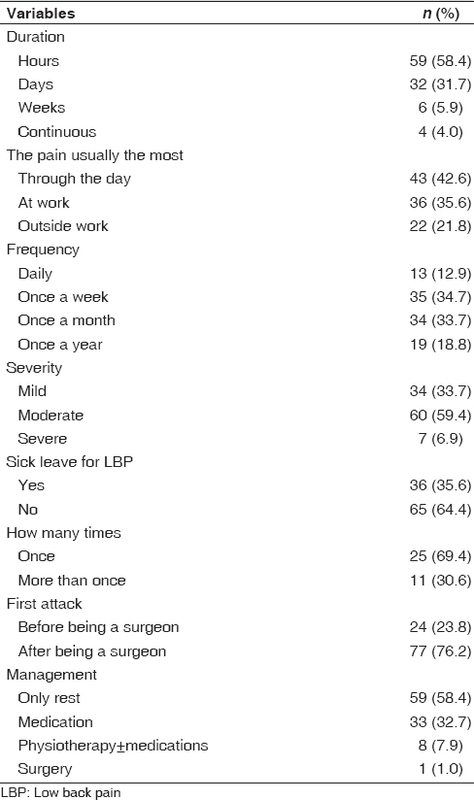 The association of lifetime prevalence of LBP and different individual and occupational factors was summarized in [Table 3], female surgeons were having LBP more than male surgeons; however, this was not statistically significant (P = 0.127). Age was not statistically significant (P = 0.411) as well, however, surgeons in fourth decade seem to be more affected, followed by surgeons in their fifth decade or older. Although obese and overweight surgeons were more affected than those who were normal or underweight, there was not a statistically significant (P = 0.915). The results also showed that married surgeons are more affected, however, it was not statistically significant (P = 0.110). Nationality was found to be highly associated with LBP (P = 0.020), Saudi surgeons were less affected than other nationalities. Moreover, there was a statistically significant (P = 0.003) regarding the hospital where the surgeons have been working, as those who work in KFH were more affected (88.1%) than KAASH (63.4%) and Al-Hada Military Hospital (60.5%). Moreover, LBP was more prevalent among orthopedics followed by gynecologists then general surgeons and that was statistically significant (P = 0.012). The level of education has no statistically significant (P = 0.751) with a small variation among residents, specialists, and consultants. Other individual factors, such as cigarette smoking, were correlated to LBP and statistically significant (P = 0.033) were smokers were more affected (86%) than nonsmokers (68.3%). A total of 74 participants (53.6%) have sport/exercise activities such as walking and running, weight lifting, or other activities, however, no statistically significant (P = 0.746) regarding having LBP with involving in sports activity (74.3%) or not (71.9%). Surgeons who lift heavy objects (>10 kg) during work 41 (29.7%) and outside work 69 (50%) were more affected (75.6%) and (76.8%), but no statistical significant (P = 0.676) and (P = 0.337), respectively. Although surgeons who usually work more than 8 hours per day seemed to be more affected, there was no statistically significant (P = 0.563). As shown in [Table 3], overall standing time in a working day was associated with LBP and statistical significant (P = 0.024) as those who stand more than 75% of the day were more affected. Surgeons who had severe stress level at work was more likely to be affected with a statistically significant (P = 0.015), those who have 6 to 15 years of practice seemed to be more affected (83.8%) even than who have a practice of more than 15 years (70.5%), and the least who affected were those who have 5 years of practice or less (68.4%), however, it was not statistically significant (P = 0.229). The results in [Table 4] show different preventive strategies used by surgeons and their association with having LBP, despite that 23 of the participants did not use any of the strategies and 8 (34.8%) of them did not experience LBP, there was a statistically significant (P = 0.044), as using good and comfortable shoes was associated with the lowest prevalence of LBP (23.6%) followed by the other preventive strategies summarized in [Table 4]. The current study also showed many significant correlations between the prevalence and different risk factors and occupational and personal characteristics that have been investigated such as nationality, hospital, specialty, overall standing hours, perceived level of stress, smoking, and using different preventive strategies. Meanwhile, gender, age, BMI, and working hours per day were not statistically significant. 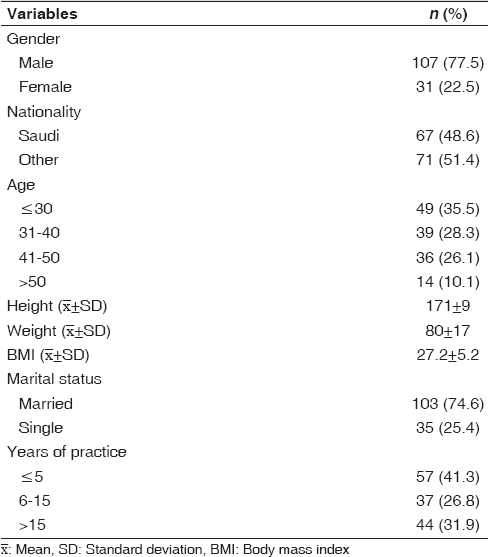 Nationality was significantly associated with LBP as Saudi surgeons were less affected than other nationalities, but that might be because most of Saudi surgeons in our study were younger and they are mostly residents, and most of consultants, and specialists who are older were non-Saudis. After reviewing the previous studies, there was a defect in investigating the difference between tertiary hospitals' staff and general hospitals' staff as having LBP, our data were collected from one general hospital KFH (42.8%) and two tertiary hospitals KAASH (29.7%) and Al-Hada Military Hospital (27.5%), and it seemed that LBP is more prevalent among general hospitals' staff than tertiary hospitals with a significant association. Another significant association is specialty, as orthopedists were more affected may be due to long-time operations and the need for heavier physical activity, and that was consistent with a study conducted among Iranian surgeons. Overall standing time in a working day, perceived level of stress at work, and smoking found to be associated with the prevalence of LBP worldwide and even in Saudi Arabia.,, In addition, it was found prolonged standing especially in operation theaters associated with increased risk of having LBP, as well as high overload and severe stress perceived at work. Our results were not different from these worldwide results as we found surgeons who are smokers, perceive a severe stress at their jobs, and stand more than 75% of a work day are more affected with LBP with a significant association. Among the participants in this study who have LBP 59 reported that rest is the best relieving factor, 33 participants use painkillers to relieve the pain, 8 participants received physiotherapy along with painkillers to manage their LBP, and only one surgeon who underwent surgery for his LBP. Only 36 of those who have LBP got sick leave for their pain at least once. A study conducted among hospital stuff in Tunisia reported that 42% of the sample received medical treatment, 15.9% received thermal care and 9.6% received physiotherapy, and only one participant needed surgical intervention. Moreover, 26.1% of the sample got sick leave due to LBP with a mean duration of 4.5 days. Another study done among surgeons in Iran showed that 29.1% of the participants used medication for their LBP, 23.6% received physiotherapy, 39.1% had both medication and physiotherapy, 8.2% had surgery along with medication and physiotherapy, and 24.7% had sick leave with an average duration of 20.5 days. Furthermore, many other studies reported high rates of having days off work because of the LBP., Therefore, as it was demonstrated in these studies, LBP has a considerable impact on job performance. Mohseni-Bandpei et al. reported that surgeons who use preventive strategies have lower chance to have LBP with a significant association. In the current study, we investigated different preventive strategies [Table 4], there was a significant association even though we found those who do not use preventive strategies were less affected. However, that is most probably due to the small sample size. Using good and comfortable shoes was the most effective strategies to prevent the occurrence of LBP, followed by different behaviors such as stand erect or sit straight and avoid slouching. The small sample was obtained in a relatively small city, the size of the sample was affected by many factors such as only few hospitals in the city, and the majority are tertiary hospitals. Surgeons were approached during their work duties; hence, besides the effect on sample size as surgeons who were absent, off-duty, or having crowded schedules could not be approached or refuse to participate, it also affected the precision of data due to stress or shortage of time. In the current study, the data were self-administrated; hence, it may affect the precision of answers to the retrospective questions regarding the time and frequency of LBP. LBP has a considerable impact on job performance and frequently cause work absence, and it has a high prevalence in the healthcare field. The current study focused on surgeons showing that LBP has affected 73.2% of them. Smoking, working in a general hospital, long-standing time, and high-stress level at work are associated with higher prevalence of LBP. Educational programs and campaigns must be implemented for surgeons to raise awareness about LBP and applying more studies to evaluate the effect of these programs for higher quality of life and better job performance for them. The authors would like to thank Hanadi Alharthi, Rawabi Algethami, Jumanah AlMalki, Sara AlShalan, for their active role in data collection and Abdulrahman Alzahrani for his great help in data analysis and Aiman Alturkistani for reviewing the article for languages affairs. Peng B, Chen J, Kuang Z, Li D, Pang X, Zhang X, et al. Diagnosis and surgical treatment of back pain originating from endplate. Eur Spine J 2009;18:1035-40. Balagué F, Troussier B, Salminen JJ. Non-specific low back pain in children and adolescents: Risk factors. Eur Spine J 1999;8:429-38. Cassidy JD, Côté P, Carroll LJ, Kristman V. Incidence and course of low back pain episodes in the general population. Spine (Phila Pa 1976) 2005;30:2817-23. Hoskins AB. Occupational injuries, illnesses, and fatalities among nursing, psychiatric, and home health aides 1995-2004. Available at: http://www.bls.gov/opub/cwc/sh20060628ar01p1.htm. [Last accessed on 2011 Jan 10]. Mohseni-Bandpei MA, Ahmad-Shirvani M, Golbabaei N, Behtash H, Shahinfar Z, Fernández-de-las-Peñas C. Prevalence and risk factors associated with low back pain in Iranian surgeons. Pak J Med Sci 2011;34:362-70. Mirbod SM, Yoshida H, Miyamoto K, Miyashita K, Inaba R, Iwata H, et al. Subjective complaints in orthopedists and general surgeons. Int Arch Occup Environ Health 1995;67:179-86. Salik Y, Ozcan A. Work-related musculoskeletal disorders: A survey of physical therapists in Izmir-Turkey. BMC Musculoskelet Disord 2004;5:27. Mohseni-Bandpei MA, Fakhri M, Bargheri-Nesami M, Ahmad-Shirvani M, Khalilian AR, Shayesteh-Azar M. Occupational back pain in Iranian nurses: An epidemiological study. Br J Nurs 2006;15:914-7. Bin Homaid M, Abdelmoety D, Alshareef W, Alghamdi A, Alhozali F, Alfahmi N, et al. Prevalence and risk factors of low back pain among operation room staff at a tertiary care center, makkah, Saudi Arabia: A cross-sectional study. Ann Occup Environ Med 2016;28:1. Karahan A, Kav S, Abbasoglu A, Dogan N. Low back pain: Prevalence and associated risk factors among hospital staff. J Adv Nurs 2009;65:516-24. Al Dajah S, Al Daghdi A. Prevalence and risk factors of low back pain among nurses in Sudayr region. Eur Sci J 2013;9:198-205. Attar SM. Frequency and risk factors of musculoskeletal pain in nurses at a tertiary centre in Jeddah, Saudi Arabia: A cross sectional study. BMC Res Notes 2014;7:61. Al-Arfaj AS, Al-Saleh SS, Alballa SR, Al-Dalaan AN, Bahabri SA, Al-Sekeit MA, et al. How common is back pain in al-qaseem region. Saudi Med J 2003;24:170-3. Keriri H. Prevalence and risk factors of low back pain among nurses in operating rooms, Taif, Saudi Arabia. Am J Res Commun 2013;1:25. Koes BW, van Tulder MW, Thomas S. Diagnosis and treatment of low back pain. BMJ 2006;332:1430-4. Babar-Craig H, Banfield G, Knight J. Prevalence of back and neck pain amongst ENT consultants: National survey. Indian J Otolaryngol Head Neck Surg 2003;117:979-82. Alghadir A, Zafar H, Iqbal ZA, Al-Eisa E. Work-related low back pain among physical therapists in Riyadh, Saudi Arabia. Workplace Health Saf 2017;65:337-45. Chatterjee A, Ryan WG, Rosen ES. Back pain in ophthalmologists. Eye (Lond) 1994;8 (Pt 4):473-4. Ferguson SA, Marras WS. A literature review of low back disorder surveillance measures and risk factors. Clin Biomech (Bristol, Avon) 1997;12:211-26.
van Poppel MN, Koes BW, Devillé W, Smid T, Bouter LM. Risk factors for back pain incidence in industry: A prospective study. Pain 1998;77:81-6. Palmer KT, Walsh K, Bendall H, Cooper C, Coggon D. Back pain in Britain: Comparison of two prevalence surveys at an interval of 10 years. BMJ 2000;320:1577-8. Hoogendoorn WE, Bongers PM, de Vet HC, Ariëns GA, van Mechelen W, Bouter LM, et al. High physical work load and low job satisfaction increase the risk of sickness absence due to low back pain: Results of a prospective cohort study. Occup Environ Med 2002;59:323-8. Ouédraogo DD, Ouédraogo V, Ouédraogo LT, Kinda M, Tiéno H, Zoungrana EI, et al. Prevalence and factors associated with low back pain among hospital staff in Ouagadougou (Burkina faso). Med Trop (Mars) 2010;70:277-80. Vasiliadou A, Karvountzis GG, Soumilas A, Roumeliotis D, Theodosopoulou E. Occupational low-back pain in nursing staff in a greek hospital. J Adv Nurs 1995;21:125-30.